I've posted before about using Google Maps to reinforce geography, but today's post will be about how to harness the power of street view to provide students with a fun activity that's also authentic. This can be done as homework or in a computer lab (as I did it). I actually let students work in groups because the task can be a little challenging. Once you're familiar with how to make a Google Map, this task will be a lot easier. I made a scavenger hunt related to different eateries, but you could make a similar one related to shopping for clothes or other things you might see around town. 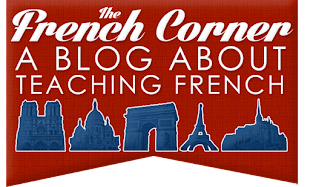 I focused my scavenger hunt on Paris, since there is such a variety of different places to eat there. I should probably mention right about here that this task does take some time, but you're welcome to use my map if it suits your needs (there is one reference to me in there though), or use it as a starting point. 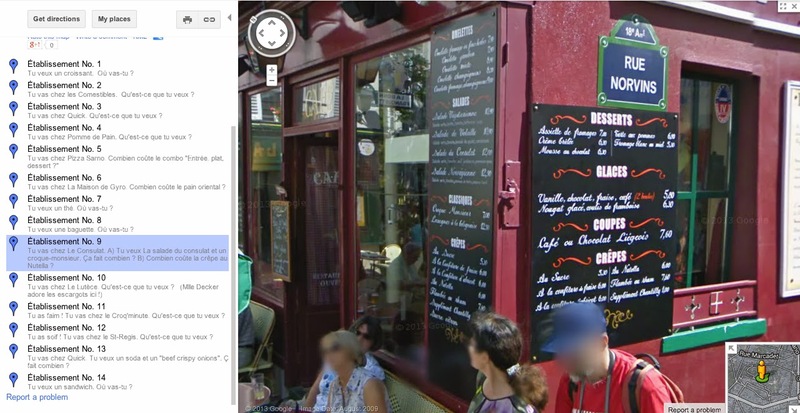 Basically, you need to "walk" around the neighborhoods of Paris in Google Street View until you find a spot you want to ask a question about. I mostly chose establishments in the Quartier Latin, Île St-Louis, and Champs-Élysées. With eateries, you need to find places whose menus are readable upon zooming in (unfortunately, not always possible). You don't need all the establishments to have readable menus, though. Some of the questions can center around what they see in the window or advertised on the awning. Then you drag your place mark to that spot. Keep moving it a little until it is EXACTLY in the right spot when you right click on it and click "Street View," otherwise your students are apt to get lost and confused. The only moves they should have to make are to turn around at most. Another reason not to have to make them maneuver in street view is that Google doesn't always upstate their street view imagery uniformly. There are some areas where from one angle you see a restaurant, then you move a foot forward and it becomes a souvenir shop! -Tu vas chez _____________. Qu'est-ce que tu veux ? -Tu veux un croissant. Où vas-tu ? -Tu vas chez _____________. Combien coûte le ___________ ? -Tu vas chez _____________. Une salade et un soda, ça fait combien ? 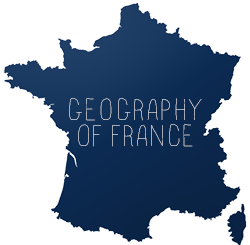 The students love this activity because they love Google Maps (especially Street View), and they inevitably pick up on other cultural tidbits along the way. Students who finished the activity early were given free reign to explore Paris on their own. I encouraged all students to continue exploring Paris (and the rest of the francophone world) on their own at home. Update December 2014: Google no longer supports Street View in custom maps. This is a huge impediment to this activity, but you can still make it work by having students manually type in addresses. Put the questions in a separate file or on a printed sheet. Unfortunately, the address doesn't always drop students in the exact same spot. This manual method adds some frustration, but overall, the feedback I got from students after trying it this way was that it was still fun and engaging for them. 1. 14 rue Monge, Paris -- Tu veux un croissant. Où vas-tu ? 2. 3 rue du Mont Cenis, Paris -- Tu vas chez les Comestibles. Qu'est-ce que tu veux ? 3. 4 rue du Colisée, Paris -- Tu vas chez Pomme de Pain. Qu'est-ce que tu veux ? 4. 15 rue Xavier Privas, Paris -- Tu vas chez La Maison de Gyro. Combien coûte le pain oriental ? 5. 15 rue Xavier Privas, Paris -- Tu vas chez La Maison de Gyro. Le pain oriental et le gyros baguette, ça fait combien ? 6. 19 rue de la Huchette, Paris -- Tu vas chez Amorino. Deux “petits” cornets de glace, ça fait combien ? 7. 20 rue Norvins, Paris – Tu veux une baguette. Où vas-tu ? 8. 20 rue Norvins, Paris – Tu as faim ! Tu vas chez le Consulat. Qu’est-ce que tu veux ? 9. 9 rue du Mont Cenis, Paris -- Tu vas chez le Croq'minute. Combien coûte la crêpe chocolat ? 10. 9 rue du Mont Cenis, Paris -- Tu as soif ! Tu vas chez le Croq'minute. Qu’est-ce que tu veux ? 11. 19 rue de la Harpe – Tu vas chez Le Saint-Séverin. Combien coûte la combinaison “gourmet” ? Ah mais non! Il y a un énorme camion dehors le 14 rue Monge!